Bruce Golden, Red Sky, Blue Moon. Shaman Press, 2013. Pp. 379. ISBN 978-1-4841332-2-4. $3.99 (e-book)/$15.99 (paperback). Can a fairly long book with a multitude of characters move swiftly enough, hold the reader’s attention, and make sense of it all? Well, it can if it never gets bogged down in thickets of purple prose, if its characters are vibrant and as real as the person next to you, and if you believe the world these character inhabit could actually exist. While the plot may seem well-worn, the setting and the circumstances surrounding Bruce Golden’s new book aren’t. Red Sky, Blue Moon is about as far from the satire of Better Than Chocolate (2007) or the mysterious forests of Evergreen (2009) as you can get. If this book were a film (and there’s something very cinematic about it), it would be described as an epic adventure. Aliens who may have seeded the first life on Earth, return eons later, collect humans in massive groups from various societies, and transplant them on another world as a sort of science experiment. More than a millennium later, these transplanted cultures have evolved differently than they would have on Earth. One of these cultures grew from the barbaric roots of Scandinavian Vikings, circa 10th Century Earth. They have developed into a cutthroat corporate society in an early industrial stage. The political machinations and corporate maneuvering combine to create an intriguing socio-cultural dynamic. In addition, they’re racial purists to whom even the slightest birth defect or genetic disease is a social stigma. Despite this, they are plagued by a cancer-like disease they call the “blight”, though few publicly acknowledge it when they find they’re stricken. When one corporation’s chief discovers the savages living on another continent have no trace of the disease, and also seem to have longer life spans, he plots to learn their secret—a secret which could bring him both wealth and power. These “savages” as the “corporatocracy” thinks of them, were culled from various Native American Sioux tribes sometime in the early 18th Century. They’ve only been on this world a few hundred years, and haven’t changed that much from the people of the plains most readers are familiar with. It’s the juxtaposition of these two societies and the conflict between them which form the heart of this book (though the corporate Aesir are also in conflict with their lower-class Vanir workers). What I liked about Golden’s representation of the Aesir is that they don’t think of themselves as evil. However, their disdain for other races, other cultures, other peoples as fellow human beings even, leaves the reader little choice but to think of them as such. “Yes, yes,” she responded indifferently. “Though I think it was unnecessary to adorn the proceedings with the Vanir riffraff.” She glanced at the gallows on the periphery of the gathering where the bodies of nine men dangled in the gentle sea breeze. The storyline of this book is somewhat predictable. However, in this work, it’s the journey more than the destination that will enthrall readers. That said, there’s an obvious social-consciousness woven throughout the plot. We’ve seen the tale of the more advanced but brutal invaders harass and murder the "innocent savages." It’s been a part of our history on almost every continent. Of course not all the Aesir are inherently evil, but they're raised in a racist culture that makes it tough for all but the more independent thinkers to give that prejudice a second thought. When it comes to colonizing the lands of those "savages," the Aesir leaders think no more of it than if they were invading the grazing lands of cattle or exterminating a population of rodents. Indirectly, Golden makes statements about both mankind’s exploitation of disparate cultures and its abuse of the environment. Yet he also juxtaposes the similarities of the two cultures, which provides a ray of hope by book's end. Like his previous novel Evergreen, this book is so rich in characters and detail that you won’t want to let it sit idle for too long, or you’ll forget who’s who and what’s what. But it’s the attention to detail, and the marvelous world-building, that make Red Sky, Blue Moon a completely enjoyable read. That and the fact that, like Golden’s other works, this book is fast-paced, moving through relatively short chapters, keeping the reader hooked as he goes. If you enjoy pages and pages of prosaic description, this book probably isn’t for you. Golden is known more for his dialogue and authentic, memorable characters. He doesn’t spend much time with complicated metaphors and elaborate descriptive phrases. I believe that’s why his scenes have more of a cinematic feel. As for the aliens who brought the humans to this world, their story is more of a footnote, told in journal-like excerpts in the prologue and at the beginning of some of the chapters. Their eventual fate is a bit of a surprise, but woven nicely throughout the main story. If you love intricate world-building, this is the book for you. Golden has taken the history, traditions, and cultures of the Sioux and the Vikings, and woven them into a completely new world, much the way Frank Herbert used Islamic and other cultures in Dune (though this book does not have the galactic scale of Dune). 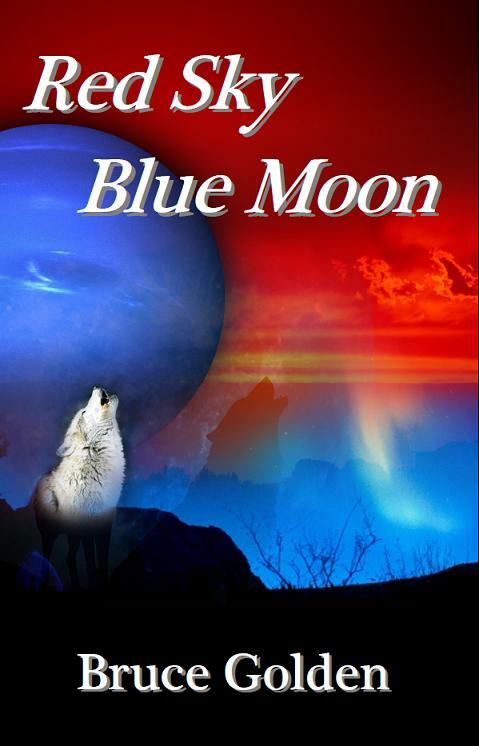 Red Sky, Blue Moon is a satisfying, heroic science fiction tale featuring romance, war, and intrigue that should draw you in and hold your interest until the very end. It’s the kind of book you want to read again a year later to see what detailed tidbits you might have missed the first time around. Sounds like it's worth a read.